Basic beer aroma, but with a hint of citrus. Average head with minimal lacing. Okay, so I've been called old fashioned. 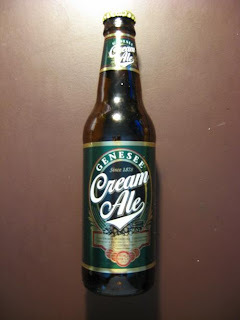 But of all the old timey beers I remember most from my college days, there was always Genny Cream Ale. Oh, and by the way, if you think it 'aint got taste, then you should visit their ultra cool website. This is not your father's beer, here! The reaper has been digging Genny for so long for four reasons. One, it was local and therefore cheap to buy. Two, it has smooth, great taste. Three, it has a 5.2% kick above your regular beer. And four, did I mention it tastes great? Nothing else here to write about....now go out and get some!